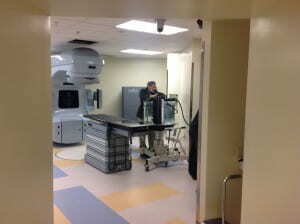 The RSEL is home to a Varian Clinac iX linear accelerator and Sun Nuclear 3-D Scanner. Building on the RSEL’s partnerships with Sun Nuclear and Varian Medical Systems, the Clinical Rotations in Medical Physics provides exposure to both practical hospital experience and the in-depth training only afforded in the RSEL’s Varian Clinical Linear Accelerator (VCLA) Laboratory.The course consists primarily of shadowing Emory clinical physicists and personnel to become familiar with the operations of a radiation oncology department. The RSEL serves a crucial role in this experience by providing a level of access to instrumentation and expertise typically reserved for a clinical environment. Throughout the course, students use the laboratory to gain hands-on familiarization with operation of the linac and other dosimetry tools for calibration and validation. The VCLA Laboratory’s linear accelerator is identical in form and function to accelerators used in many radiation oncology centers around the world, with principal modes of 6 and 18 MV for photons and up to 24 MeV for electrons. The Sun Nuclear 3-D scanner completes this training environment as one of the most advanced 3-D dosimetry and quality assurance tools.